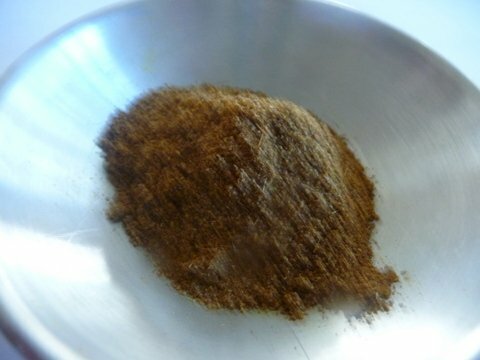 Chili powder is a curious product, often misunderstood. For one thing, the kind you find in the supermarket on the A-to-Z shelf of single herbs and spices is not itself a single spice, made only from powdered dried chiles. While there is no established formula for making chili powder, it typically consists of about 80 percent chile pepper blended with garlic powder, oregano, ground cumin seed, sometimes salt, and occasionally monosodium glutamate. Some blends even include traces of clove, allspice, anise, and coriander. Although a number of powders made solely from chiles can now be found in ethnic and specialty markets, we stuck to blends because they are what most Americans cook with. 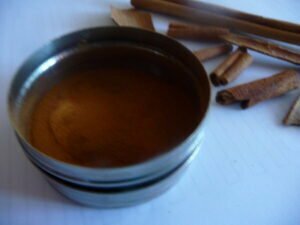 Cinnamon (Dalchini) -The dried bark of various laurel trees in the cinnamomun family. is a sweet-tasting spice, with a warm, woody aroma. The smell of Cinnamon is pleasant, stimulates the senses, yet calms the nerves. The thinnest bark is the best quality cinnamon. It is available as a powder form as well but is much better bought in sticks. When ground, the flavor becomes stronger. Whole cinnamon is used for spicing hot drinks, and ground is used – in cakes, sweet dishes, fruit pies (especially apples).. and Chai spice. 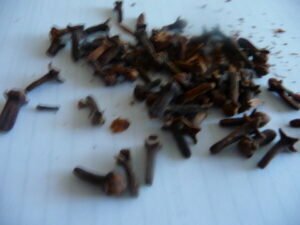 Cloves (Lavong) – Small, dried, brown flower buds of the tropical evergreen tree . They have strong, sweet aroma and hot, pungent taste, Cloves are best bought whole and grind to your need, if necessary. They have been used in India for thousands of years, not only in cooking, but to sweeten the breath, and they contain a mild anesthetic. Whole cloves are frequently used to flavor meat dishes, curries, and soups. State of Kerala grows Cloves, Cardamoms and Black Pepper- you can buy fresh in Spice stores. Cloves are used in Ayurvedic Medicine for hundreds of years. Ground Cloves are used in Garam Masala, Chai Spice and other blends. 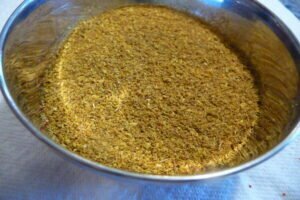 Cumin (Jeera) – Comes from the parsley family. The seeds are oval with ridges, greenish-beige in color, warm, nutty aroma and a taste that is slightly bitter, but not hot. They can be ground to a powder. Cumin and other spices are usually dry-fried before use . It is used to flavor rice, stuffed vegetables, many savory dishes and curries. Cumin and Coriander Powder mix is used in daily cooking in India, Indian Spice Box contains Dhana-Jeera Mix as one ingredient and brings out flavor of food. Jeera can be pan roasted and it really brings out special Aroma. you will find ground roasted Jeera in almost every home in India. Great to sprinkle on your plain Lassi. This roasted Jeera is great spice for Raitas and salad spice. Kokum has the same souring qualities as Lemon -Kokum is a Citrus type fruit-it is generally used dried, you can find them dried and sliced in Indian Stores, many use them as tamarind, especially enhancing coconut-based curries or vegetable dishes like potatoes, okra or lentils-Daals. Kokum is especially used with fish curries, three or four slices being enough to season an average dish. It is also included in chutneys and pickles. 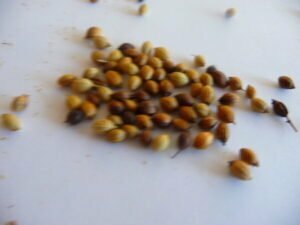 Coriander seeds and Powder(Dhaniya) -A member of a parsley family with a different aroma.The seeds are oval in shape, ridged, and turn from bright green to beige when ripen. This spice tastes sweet and tangy, with a slightly citrus flavor. The English name for this spice comes from the Greek koros, meaning “bug”. Coriander is usually sold in powdered form, the whole seeds are also available. Storing these seeds should be in a cool place-the shelf life for this spice may be 2 to 3 months unless stored in refrigerator. These seeds can be planted in your Garden if you want to grow fresh – takes short time and is very flavorful. Fresh green coriander –is used in daily food preparation in India and in many other Countries. In the USA it is known as Cilantro. Hindi word Dhania. Coriander powder is also used in fish and savory dishes as a healthy alternative to salt, and it is basic ingredient of curry powder. Many Indian dishes use Coriander and Cumin powder mix- a blend seen in many Spice boxes. This blend -Dhana-Jeera-is also available in Indian stores. These are many varieties of this powder is available in market today. Cayenne pepper is a kind of Chili powder. Remember, anytime you use your hand to touch any kind of Chili, to please wash your hands thoroughly before you touch your eyes. Touching cut green chilies should be treated with caution. Chilies – originates from India. In search of spices, Christopher Columbus set his journey from Portugal. However, Christopher Columbus landed in South America. He found that the people of South America used chilies.Columbus named them as “peppers” because they were similar in taste with black peppers. After the discovery of the spice, chili replaced black pepper as prime spice in the culinary. Chilies are fruits of a plant, generally sun dried and powdered. Chilies are grown in many Countries. There are dozens of varieties of Chilies- from sweet peppers-Paprika to Habanera to Jolokia Bhut are two of the hottest chilies in the world. Some are Bright red, some orange, Brownish and more. Sizes and shapes vary –from thin small to big and Plump. Many Varieties are available in Market today-from the whole dried chilies to powder. Depending on the dish and how hot is desired, you can use the type and the amount you want. I have found that the Kashmiri Chilies are very bright and NOT so hot. You can buy it in an Indian Store. Sometimes I blend paprika and Chili powder – which gives the bright color but is not so hot. Cardamom( Elaichi) is a spice native to the Middle East, North Africa, andScandinavia. There are three types of cardamom; green cardamom, black cardamom and white cardamom. There is large brown varity available which is generally used whole-it is not as soft as regular Cardamom. It is best to buy cardamom still in the pods. Ground cardamom is readily available and found in grocery stores. During my recent trip to India, I saw the plant of Cardamom for the first time in Kerala. 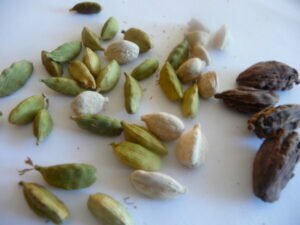 You can also buy cardamom seeds however; they lose much of their flavor once they are out of the pods.. Ground cardamom has even less flavor than the fresher ones. In most of the recipes I use green cardamom. Cardamom has a strong, unique spicy-sweet taste, which is slightly aromatic. Cardamom is more expensive than average spices. A little goes a long way. If a recipe calls for 10 pods that would equal 1 ½ tsp ground. Cardamoms last for a long time if kept in pods. I grind them -pods- in a Coffee grinder. The powder will contain the pod husk but it is very flavorful and you have to use very little. Cardamom is used in many Indian Sweet dishes and chai spice. Turmeric (Haldi)is powder made from a Dry root of a leafy plant related to ginger. It has a bright yellow color and a warm, earthy aroma and taste. Although it becomes bitter if too much used. It is mildly antiseptic. Turmeric is an essential spice in Indian food, giving a rich, appetizing color. It is used in curries, fish dishes and with beans, vegetables and other dishes because of its digestive properties. Fresh turmeric is available sometimes here in The USA in Indian Markets. The pickle made from this fresh Turmeric is favorite of many from Gujarat. It is rather tidious as removing the skin can be a chore. Fresh Turmeric root looks similar to Ginger but it is orange yellow and lean. 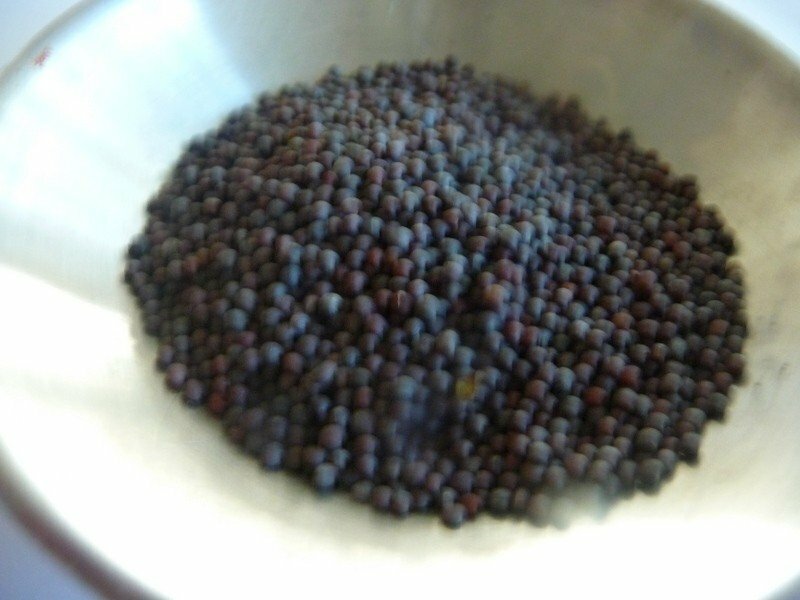 >Mustard seeds (Rai)– in Indian cooking brown mustard seeds are more commonly used but black seeds contain a higher proportion of the volatile mustard oil and strongest flavor. Both Variety is available in Indian Market.The larger yellow variety, known as white/ yellow mustard are much les pungent. Powdered mustard has no aroma when dry, but a hot taste is released when it is mixed with water. The seeds can be put whole into very hot oil and popped.Vegetables are cooked in this flavored oil or it can be poured over some dishes just before serving. Ground Mustard is used in salad dressing recipes to help blend oil and vinegar and add a spicy zip. Mustards seeds are a popular addition to dishes such as vegetable, beans, pastries and pickles.Many pickles and spreads are made with Mustard powder and lemon juice or Vinegar. It is important to know that once mixed with lemon juice, mustard tends to be very hot and tangy-if kept overnight or longer. Nutmeg (and mace -Jaifal and Javantri) – is the seed of the evergreen tree. Mace is the fleshy lattice, covering of the nutmeg (hard nut), which is golden brown in color. Nutmeg has more robust flavor than mace, but thy are otherwise very similar. The hard brown seed from the nutmeg tree (a tropical evergreen) has a warm, spicy sweet flavor. Mace is the dried lacy membrane from around the nutmeg seed. They have nutty, warm and slightly sweet flavor. Nutmeg is used to add sweet and savory flavor to dishes such as pies, custards, puddings, cakes, soufflés, vegetables,sweets and beverages. Like nutmeg, mace is a sweet and flavorful spice, which can be substituted for nutmeg or cinnamon to complement a variety of foods. Mace is also used in sauces and pickle chutneys. . . The first harvest of nutmeg trees takes place 7-9 years after planting, and the trees reach their full potential after 20 years. At one time, nutmeg was one of the most valuable spices. 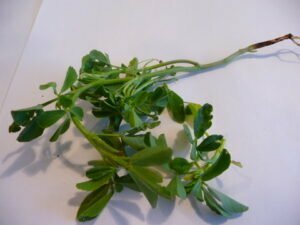 Fenugreek ( Methi) – This plant can be grown fro Fenugreek ( See detail under spice-fenugreek) seeds. Plants grow like Cilantro in small upright little plants. The leaves are used in making some Curry and other Chicken dishes. fresh leaves are bitter and have pungent quality.It is best to use dried leaves first to get used to the flavor. You may have to adopt to the taste.In many parts of India many cooks use fresh leaves to make gourmet dishes. 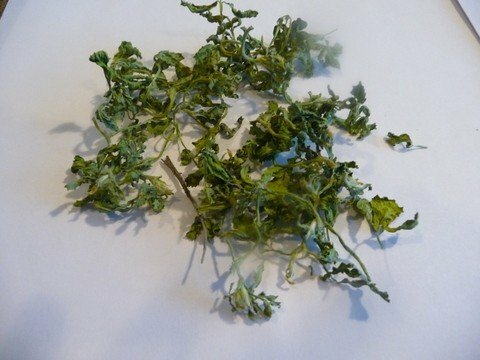 Kasuri Methi -is a dried herb-spice. The leaves of the Methi plants are sun dried and stored as they last longer time.The entire plant has a strong, aroma. The mature leaves have the bitter taste. Ground fenugreek (seeds) has a warm, yellowish-brown color with a strong curry-like taste. In powdered form, fenugreek is one of the ingredients in many curry powders. Fenugreek is used to add flavor to meat dishes. It is also considered as an aphrodisiac. Methi-fresh or dried seeds give a pungent aroma. Fresh Methi leaves are used with Daals, Curry Dishes and Vegetable, and for some Flat breads. The ground Methi seeds are used in Indian Pickle Masala mix. 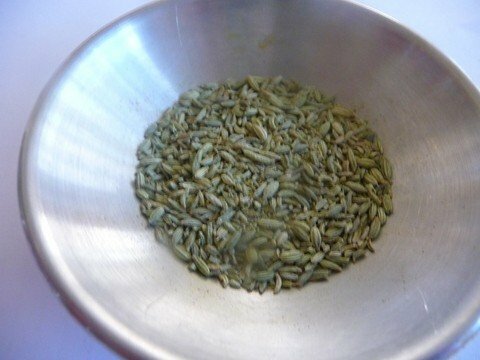 Whole Methi seeds are used in tempering to add flavor. Methi having the bitter taste, it is important to practice cooking with them and understand the taste before serving to Company. Fennel (Sounf) -Variyali- is a greenish-brown, small oval seed from , a plant in the parsley family. It has a sweet and Licorice like flavor. Used sparingly, it gives warmth and sweetness to curries. These seeds are used in many Asian dishes. The seeds combine well with peanuts and the zest of citrus fruit. Roasted fennel seeds are chewed to freshen the breath after the meal. They have digestive properties. These seeds-Variyali-coated in colored sugar coating-sold in Indian Markets are very popular among children. Green Fennel plant -leaves -sweet tasting with strong aroma like Licorice are used in Middle Eastern and In Indian cooking and they do just as good a job as Mouth freshener. Tamarind (Amli- Imli) – is the sticky, dried, brown pod of the evergreen tree. It has a sour taste and iis extremely tart, citric flavor. The pulp must be soaked before usage. In India, tamarind is mostly combined with Daals-(lentils, chick peas or beans). It adds a distinctive cooling quality to curries, chutneys. Tamerind Chtney is used with many snack dishes. The Hawkers use this chutney with many dishes. Tamerind Chutney requires a lot of sugar to make it palatable. The popular Chutney is also made by adding Dates. Start Anise : Because of its extreme olfactory similarity to anise, star anise is named after anise in many European countries. 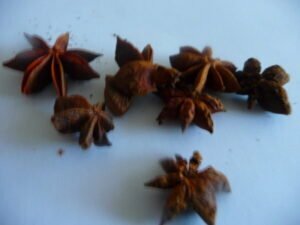 Quite often, a name for star anise if formed by combining the local name for anise with an epithet referring to the Asian origin or the characteristic star-like shape European anise is known as grain-shaped star anise in Vietnam and as badiyan romi Roman star anise in Iran. The Kashmiri name badian rather surprisingly denotes another similar spice, fennel. The origin of this spice is not clearly known to me yet it might be an adaption of Chinese ba jiao. English, and probably in other languages too. The character­istically shaped fruits (pods), always used in dried state. Besides the regular eight-pointed shape, one rarely finds single specimen with a larger number of carpels. The essential oil resides in the pericarp, not in the seed. The star shaped dry pod has a distinct aroma. Some coffee houses use it in Chai. The whole Star Anice pod give great flavor to Rice. Like anise, but stronger: Warm, sweet, aromatic. An overview on spices similar to anise. Some imports come fromChina, but the spice is also planted in Laos, on thePhilippinesand even in Jamaica. Liquorice- Jyesthi Madhu- or licorice is the root which is a somewhat sweet flavour can be extracted. The liquorice plant is a legume that is native to southern Europe and parts of Asia. It is not related to anise, star anise, or fennel. As a young girl we used to taste the fresh Fennel which tastes like Licorice but the Licorice actually is a root that has the taste. We all know about Licorice in Candy form and the taste most kids love. somehow I always thought that Licorice is black- remember the Licorice Ice Cream? Licorice grows wild in some parts of Europe and Asia.. The roots are straight pieces of wrinkled, fibrous wood, which are long and cylindrical (round) and grow horizontally underground. Licorice roots are brown on the outside and yellow on the inside. Licorice supplements are made from the roots and underground stems of the plant. Licorice is used for Medicinal purpose for ages- specially in the Ayurvedic Practice. It is a spice and since it has sweet taste and flavor, it is mainly used for sweet dishes and Deserts. 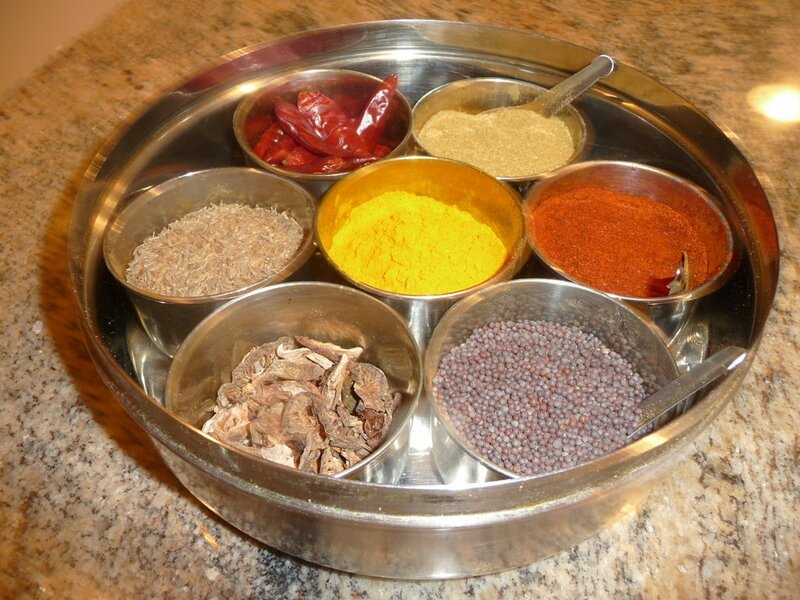 Spice box is an very important tool-gadget-container- in Indian cooking. I use it daily and keep it at easy reach in my kitchen. Almost every kitchen in an Indian Household will have a Spice Box. Ingredients may vary but the purpose is the same. This box is kept covered when not in use. This way the spices retain the freshness. Different regions have different size, shape and make of Spice Box. Spice Box is also known as Masala Box. I thought of using Dahna -Jeera instead of Cumin- Coriander powder. Mustard seed I use, are black and I am thinking using the word Raai. 2. Cumin Coriander powder-Dhana Jeera. 5. Cumin seeds- Jeera seeds. 6. Dries red whole Chillis-Aakhi Mirch. Here are the names for most ingredients so if you have any question, it is easy to find the name in English. Cumin seeds give different flavor when roasted. This powder generally is a part of kitchen essensials in an Indian Household. This is avery simple process. We did not have Grinders when i ws grwoing up- we used the stone Mortar and pestle to grind seeds if needed in small quanitties. Thaks to the modern gadgets-making roasted and ground powder is easy. I roast it in a skillet-no oil needed. Heat the skillet on medium heat and add the seeds-stir occassionally- this process takes onlky minutes so watchful eyes are important. The seeds will start turning brown and you can smell the aroma. OWhen the color of the seeds beccome slightlt lighter then coco, turn off heat and remove the seeds in a bowl. Keeping them in hot skillet may burn the seeds. Grind them in a coffee grinder to corse not fine- you can store iit in spice jar. This powder is used in raitaas, on Lassi, Kachumber etc. What is the difference between Chia Seeds and Takmaria? The main difference is that although they are both from the mint family, they are two different genus/species.Tukmaria or Ocimum basilicum L. is a type of basil: Chia or Salvia hispanica L. is a type of sage:The seeds of both are used in food, but an internet search seems to find more on the Chia. Chia seems to have Central/South American origins. Tukmaria seems to have Asian/European origins. Recently many articles have been written for Chia seeds health benefits. Takmaria have been used for ages in Indian food. These seeds are generally soaked in water for 10 minutes before using. According to Ayurvedic Gurus’ Takmaria is a coolent. The seeds puff up in water creating a translucent coating around it.Takmaria is used in many ways with Deserts. On Ice Cream, Shaved Ice, with syrup, on Fruits and with fruit juices. Kalonj- also known as Onion seeds or most recently introduced as Nigella Seeds are generally used as sprinkle on breads and salads etc.Kalojni Seeds are also known as Black Onion Seeds, Black Cumin Seeds, Black Seeds and Nigella Seeds. These seeds are very similar in size to a sesame seed, they are black in colour and have a very fragrant strong aroma. Used mainly in bread recipes and savoury dishes; kalonji has a very distinctive aroma and taste. If you love to eat Indian Cuisine then you will more than likely love the flavour of the kalonji seed. They look like black sesame seeds. Naan breads are usually sprinkled with these seeds so if you have eaten naan bread you would be familiar with the taste. You could just eat them that way. That might suffice for maintenance of health purposes. Or you could chew a few but they are quite bitter eaten alone. Aam is a word for Mango in Hindi language. Aamchoor is powder made from dry mangoes. It is earth brown in color. It taste sour and give a tangy and nutty taste to the food. This special powder is used in many dishes from North India-specially Punjabi food like, Chole, Garam Masala, Chaat Masala mix, Paav Bhaji Msala etc. Many areas in India do not get fresh lemon and, lemon juice may be difficult to keep. Aamchoor has a very long Shelf life and is easy to use. It is available in powder form. Aamchoor can be purchased in an Indian Grocery store. Garam Masala is a mixture/blend of spices. This mixture can be a family recipe or a standard one that you can buy in an Indian Market. Recently many Middle eastern Markets carry Indian grocery. Garam Masala is sold in the market in small Packets or boxes. Generally Garam Masala contain following ingredients. Mustard seeds, Cloves, Cinnamon, Dry red Chilies,Corainder seeds, Cumin seeds, Kalonji, Star Anice and more. I was browsing through the Grocery store and I found-pickling spice mix in a packet. I brought it home, took out Bay leaves, added Coriander seeds and Cumin seeds. The mixture was about 6 Oz. I added 2 Tablespoons of each Coriander seeds and Cumin seeds. Ground them in the Coffee grinder and I have perfect Garam Masala. This mixture is very Hot and Spicy and you may need to aquire the taste. Use it a little first . The shelf life of this Masala is long. Experiment it. Use it in Daals, Curries, Chicken Tika, Paneer Tika, and Vegetables. Garam Masala may vary from Family to Family -many people buy the packet mix to save time. The aroma fills the home even if used very little. Did you know that Curry powder is not made from Curry leaves? 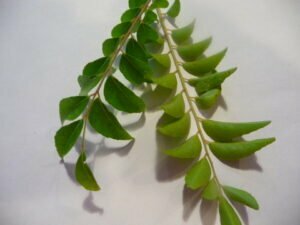 Indian name for Curry leaves is Kari Patta or Neem patta – different region have different names but the name Neem, seem to be used by most. Curry leaves are used mainly for Flavoring the food. There are many Variety of Curry plants. Some curry leaves are very dark Green and the plant can grow to a Big tree- a great shade tree. There are smaller and, somewhat lighter green leaves-the plant stays like a small fruit tree. Both have same flavor and use. These aromatic leaves are used to flavor, Soups, Daals, Vegetables, Curry and many other savory dishes. generally Curry leaves are not used to flavor any sweet dish. In some Southern Indian dishes, Curry leaves are made in to a paste along with some other items such as lemon Juice, Chili etc. Curry plants are now available in Western Countries. These plants can grow to be big shady trees. There are varieties of Curry plants but most people use the one with dark green smooth shiny leaves. the other Variety is the small green leaves. Both type of Curry leaves give a great aroma to food.They can be used fresh or dried. Their aroma is released by its heat and moisture. The Curry leaves may be chopped and added to some dishes of Southern India. They are sometimes fried in the oil the food is cooked in, and then discarded or sometimes added while the curry is being cooked. They are mainly used as an aromatic and flavoring for most curries and soups. You can find fresh Curry leaves in Indian stores. The can be wrapped in paper towel and the put in the plastic bag in the refrigerator. The last for quite a few days. 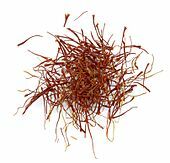 Saffron (Zaffran) Kesar – Saffron grown in Spain and other Countires. This is the Most expensive spice.This spice is made from orange colored dried stigmas of the especially cultivated crocus flower(75 stamens are needed to make 100 g (4 oz) of the spice.) It has a distinctively pungent, honey-like sweet flavor and aroma. It is available as whole threads or powdered. When ground they form a rust color powder. The best way to keep saffron for a long time store it in a tight dry container. Do not use saffron while cooking. For best result, sprinkle / mix it after cooking is done. The filaments can be lightly roasted, crumbled in a little hot water and add to your dish to infuse and to bring out their full strength. Saffron gives a rich aroma and bright yellow/orange color. Kesari means Orange-or bright orange- thus Kesar is the name used for Saffron-because of the color. When added to foods like Rice, Sweet dishes and Milk, it gives out a vibrant color and aroma. Spain produces probably World’s most Safron. When you buy it in the store, most of the time it is sold in threads form. For Best result , warm a little bit of threads and then crush them. The color comes out very vibrant. Himalayan Pink salt has been always popular in India and recently become popular in The Western World. The raw material for producing Pink salt, was originally obtained from mines in Northern India and Pakistan and, in certain locations of the Himalayan Salt ranges, or from salt harvested from the North Indian salt lakes of Sambhar or Didwana. The salt crystals appear black in color, and are usually ground to a fine powder which is pink in color. This powder is used as a condiment or added to chaats, chutneys,, Pani for Pani Purih- one main ingredient- salt. Many f other savory Indian snacks. The packaged Indian Snacks mostly have some Black salt. Kala Namak-Hindi and in Gujarati it is called Sanchal. It is also known as Black Salt . This is a kind of Rock Salt with sulfur-thus giving pungent smell. Chaat Masala, an Indian spice blend, is dependent upon black salt for its characteristic sulfurous hard-boiled egg aroma. Those who are not accustomed to black salt often describe the smell as extremely pungent. It is considered a cooling spice in Ayurvedic medicine and is used as a Laxative and digestive aid. Chaat Masala also spelled -Chat Masala is a mixture of spices used in Indian Cuisine as a flavoring or garnishing spice. Because it contains certain spice-like Asafotida, it is pungent. Once you get over the initial smell, it is sour and quite spicy and adds a different spicy taste to snack dishes.This Masala typically consists of amchoor (dried mango powder), cumin, Kala Namak-black salt, coriander, dried ginger, salt, black pepper, Asafoetida and chili powder. This spice has some middle Eastern influence. It was introduced in India by the population in Punjab and near the border of India and Pakistan. This spice is used in Dahi Vada, Chaat Papdi, and even sprinkled on Fruits. Start out using just a pinch or a little to sprinkle as garnish and then slowly add more as you get used to it. This spice mix is available in Indian and some Middle Eastern Markets. Best to store in the Refrigerator in plastic bag so the flavor is not lost. This spice has a very long shelf life. Spices and herbs contain aromatic substances called “essential oils”, which are responsible for the aroma and much of the flavor. Most spices and herbs are available in ground and whole form. Whole herbs and spices last much longer than crushed or ground. Many people prefer to buy the whole form and crush or grind as needed. Herbs and spices can be crushed with a mortar and pestle, or a coffee grinder. Check ground spices for freshness at least once a year. If no aroma is detected, the seasoning needs to be replaced. Spices and herbs lasts longer and retains the quality if kept in tightly closed containers in a cool, dry, dark place. A screw-cap container is better than a flip-top container because it can be tightly resealed. 1. Keep the spices away from heat. Do not store near dishwasher or refrigerator, and they should never be stored near the range, even though it may seem more convenient. Heat, air, and light cause aromatic oils to evaporate, which causes spices and herbs to lose their flavor. 2. Store away from moisture as dampness will cause caking and loss of quality. Store in tightly covered jars and use clean, dry spoons for measuring. If you live in a high humidity area you may experience difficulty with caking. 3. Store in cool place away from light. Do not store in a window or in sunlight. 4. It is good to refrigerate cayenne pepper, chili powder, and paprika to retain color longer. A ratio of one part dried herbs to three parts fresh herbs works as a general rule because most dried herbs have a more intense, concentrated flavor than the fresh ones. Example: when a recipe calls for one tablespoon of fresh herbs, one teaspoon of dried herbs can be substituted.